This updates and distills an article posted 4/13/12. After the March 2010 Barclays Center groundbreaking, Daily News sports columnist Mike Lupica commented, "It was a hustle in broad daylight by Caring Bruce Ratner from the start." The hustle wouldn't have worked without help from Forest City Ratner's partner in government, the Empire State Development Corporation, aka Empire State Development (ESD). It as clear an example of the Culture of Cheating as any. 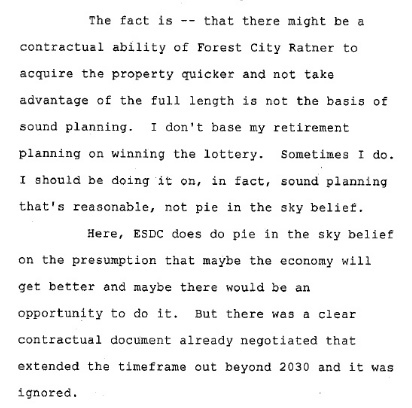 ESD had recently completed a clever, devious move, withholding the Development Agreement for Atlantic Yards, thus obscuring a project timetable that gave Forest City 25 years to build the project, rather than the long-promised ten years. Now courts have said definitively that the ESD chose expediency over candor, in order to get Atlantic Yards re-approved in 2009 and to enable that groundbreaking. Now a supplementary environmental review is necessary. However little the decision may change things on the ground, it's a moral victory and an important message about honest government and the lack thereof. 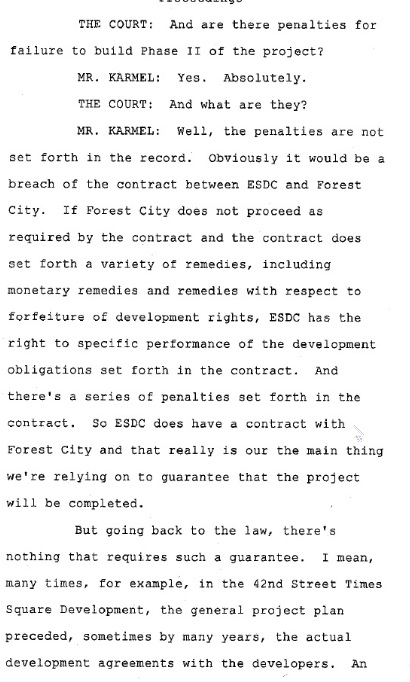 "But the reason why we think Forest City will go forward with this project, and we have every reason to believe so, is that we have a Development Agreement with Forest City that requires it to do so," agency attorney Philip Karmel said in court in January 2010, as detailed below. "I don't know what else ESDC can do." Well, it could have released that document, which would have revealed how the developer had 12 years to build Phase 1 and 25 years for Phase 2, rather than incentives to get the whole thing done in a decade. Sounds like ESDC has some ‘splainin’ to do. I’ll be curious to see if the mainstream New York media digs deeper, considering we have a multi-billion New York City project here – and successive court rulings rebuking the judgment of the state agency that is supposed to be the people’s watchdog to make sure the project rolls out properly. But there was no explaining, and there was no apology. Both the state agency and Forest City expressed disappointment with the ruling and said they were moving ahead with the project. Gov. Andrew Cuomo could apologize. It wasn't his fault. He inherited this after his election in 2010. But he's shown no such inclination. He's not attending the ribbon-cutting today, instead staying in Albany and sending Lieutenant Gov. Bob Duffy in his place. Is that because he has more pressing business in the capital city? Perhaps, though he has no public schedule.. Or does he want to avoid even a whiff of controversy. Though the courts didn't go there, evidence suggests the ESD simply cheated. Atlantic Yards was re-approved in September 2009 to allow for multiple phases of condemnations, rather than one full round, thus saving Forest City Ratner from paying to acquire the property it didn't need soon. The timetable for the project would be enforced by the Atlantic Yards master closing documents, including the Development Agreement, which were signed in December 2009. But those documents weren't released until 1/25/10, six days after the first hearing in this case was heard in court. It was also nearly three weeks after the ESDC told me the documents would be made available. She said the document(s) would not be made available "until a week or two after the closing," meaning approximately 12/30/09 through 1/6/10. That didn't happen. As a political reporter, I know that money and spin usually win. But in looking at Atlantic Yards up close, it’s outrageous to see the absolute absence of democratic process. As Develop Don't Destroy Brooklyn's Candace Carpenter said in April, "The tragedy here is, but for the blatant misrepresentations to the Court by Forest City Ratner and ESDC, it would been determined in 2010 that an SEIS was required and that would have stopped construction of Barclays Arena." Maybe, maybe not--there was still a ton of political momentum. But it would have been a lot easier to stop it before the groundbreaking. 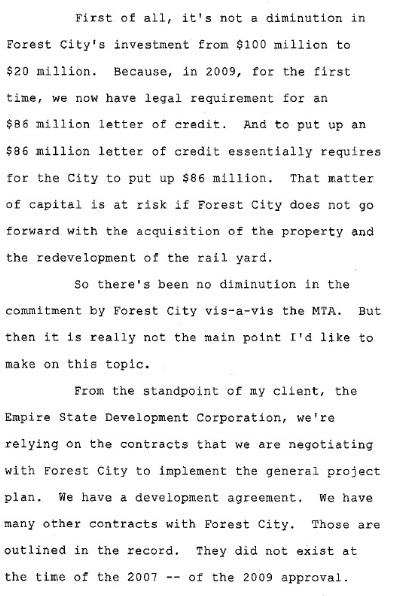 In that case, the main document was the agreement with the MTA for the Vanderbilt Yard, which gave Forest City Ratner 22 years to pay for the development rights. However, the Development Agreement offered far more reason for skepticism, as it showed a clear contradiction with the professed time frame. But Friedman did not allow it to be entered into the record. 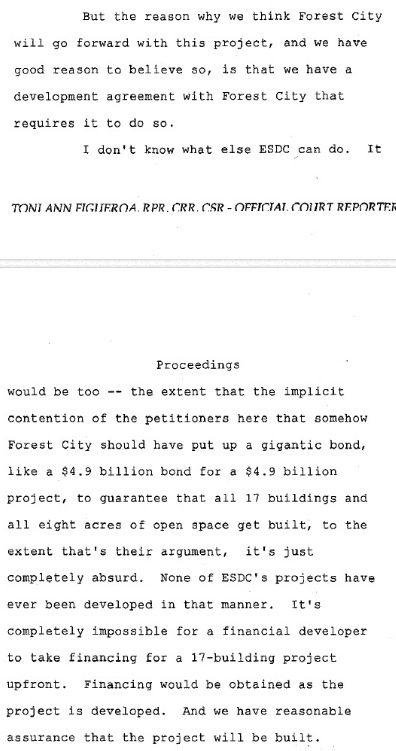 Later, after both sets of petitioners asked Friedman to reopen the case, she did, acknowledging a misapprehension--though not quite a mistake on her part--about the Development Agreement. In November 2010, Friedman remanded the proceedings "to ESDC for findings on the impact of the Development Agreement and of the renegotiated MTA agreement on its continued use of a 10 year build-out for the Project, and on whether a Supplemental Environmental Impact Statement is required or warranted." She rejected those finding, and the appellate court agreed in April--a decision confirmed in June when the state Court of Appeals rejected an appeal. It took well over two years. Where would we be if the Development Agreement had been released on time? 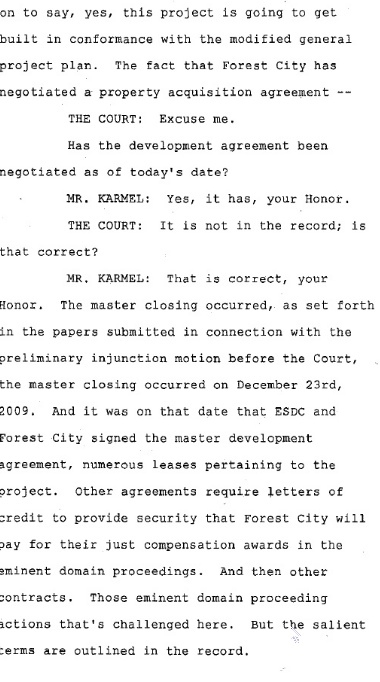 The discussion begins on page 222 of the document at bottom, but I've excerpted the key passages from ESDC lawyer Philip Karmel, who said "we're relying on the contracts that we are negotiating," a statement the implies they were not settled, though he then said, "We have a Development Agreement." The principal terms of the agreement, he said, were outlined in the record. They weren't, because no one knew how light the penalties were. "Well, the penalties are not set forth in the record," Karmel admitted, saying the Development Agreement was finished, but not part of the case. That's where, in retrospect, the court should have stepped in. 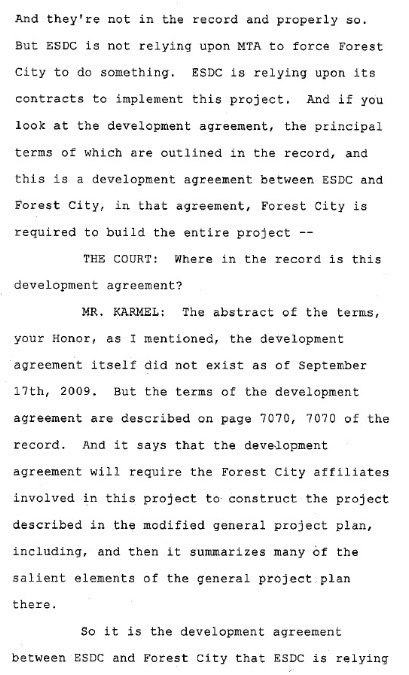 Somewhat later in the court argument Karmel returned to the theme, saying "we have a development agreement with Forest City that requires it" to "go forward with the project. Only when the document was revealed did the judge reverse her findings. The issue of the 25 year project was raised earlier, before another judge, who looked the other way. Still, the Development Agreement, with a clear 25-year deadline, did not exist at this time.